Neil A. Armstrong joined the National Advisory Committee for Aeronautics at the Lewis Flight Propulsion Laboratory, Cleveland, Ohio, in 1955. He transferred to the NACA High-Speed Flight Station at Edwards Air Force Base, California, in July 1955, as an aeronautical research scientist. He became a research pilot later that year. Neil was named as one of nine astronauts for NASA's Gemini and Apollo Projects, leaving the Center for the National Aeronautics and Space Administration's Manned Spacecraft Center, Houston, Texas, in September 1962. 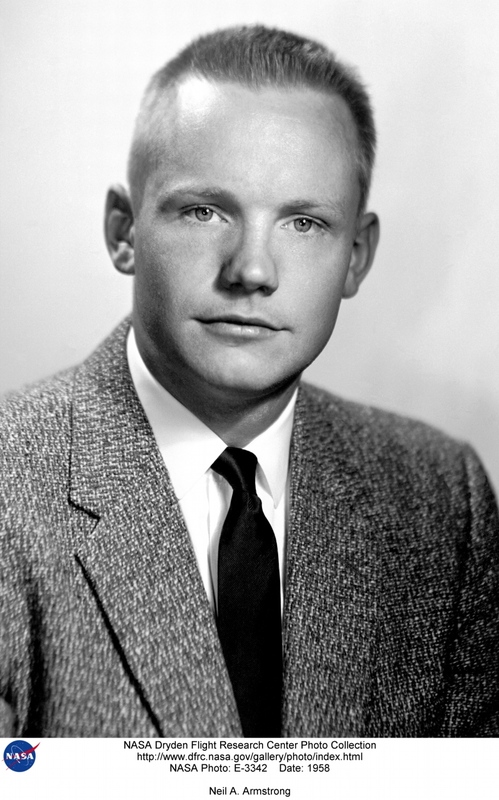 Upon graduation from High School in 1947, Armstrong received a scholarship from the U.S. Navy. He enrolled at Purdue University to begin the study of aeronautical engineering. In 1949, the Navy called him to active duty and he became a navy pilot. In 1950, he was sent to Korea where he flew 78 combat missions from the carrier USS Essex in a Grumman F9F-2 Panther. He received the Air Medal and two Gold Stars. In 1952, Armstrong returned to Purdue University and graduated with a bachelors degree in aeronautical engineering in 1955. He later earned a masters degree in aerospace engineering from the University of Southern California. At the High-Speed Flight Station (which later became the NASA Dryden Flight Research Center) Armstrong served as project pilot on the North American F-100A and -C aircraft, McDonnell F-101, and the Lockheed F-104A. He also flew the Bell X-1B (4 flights, first on August 15, 1957), Bell X-5 (one flight, the last in the program, on October 25, 1955) and the Paresev. On November 30, 1960, Armstrong made his first flight in the X-15. He made a total of seven flights in the rocket plane reaching an altitude of 207,500 feet in the X-15-3 and a Mach number of 5.74 (3,989 mph) in the X-15-1. He left the Flight Research Center with a total of 2450 flying hours in more than 50 aircraft types. He was a member of the USAF-NASA Dyna-Soar Pilot Consultant Group, and studied X-20 Dyna-Soar approaches and abort maneuvers through use of the F-102A and F5D jet aircraft. Armstrong later accumulated a total of 8 days and 14 hours in space, including 2 hours and 48 minutes walking on the Moon. In March 1966, he was commander of the Gemini 8 mission that performed the first successful docking of two vehicles in space. As spacecraft commander for the Apollo 11 lunar mission, on July 20, 1969, he became the first human to set foot on the Moon. In 1970 he was appointed Deputy Associate Administrator for Aeronautics at NASA Headquarters. He resigned in 1971. Neil wrote several technical reports and presented a number of research papers. In June 1962, the Octave Chanute Award was presented to Neil by the Institute of the Aerospace Sciences. Other awards received by Neil have included the NASA Distinguished Service Medal and the NASA Exceptional Service Medal.